Apollonius of Tyana : Who wrote the Epistles in the New Testament? "Apollonius of Tyana - The Nazarene". It took some very interesting enlightening turns, as you might agree. I hope you (a) enjoy, (b) think on it. Thank you. Mead in his "Apollonius of Tyana" (1901) actually said quite plainly that Apollonius went to "Arabia", meaning south of Roman Palestina (see the third map below), but didn't specify his age, nor the length of time he spent there. Apollonius was basically in 'the outback' Mead says, with various other aesthetics and people working on 'the inner life'. It's when I worked out Apollonius' age for the period he was in Roman Judea, that got my attention . He was still "young" (mid 30s?) Mead says, when he began his trek into the Hindu Kush via north Iran, Afghanistan and Pakistan, after which he went down into India. After his five years of silence at 'Pythagorean school' in Ægae (around age 23-28), Apollonius spent some years in "Arabia". This was before he went across the Hindu Kush mountains (around mid-30s). Therefore, the age Apollonius was in Palestina-Arabia was when he was around 29-34 years old. A strange coincidence? That is: Apollonius was in Palestina-Arabia at the same time in history (34-37 CE) the supposed "Jesus" was in ministry, at around age 30-33. How easy it would have been for the "Church Fathers" (Roman elite families) in 325 CE at the Council of Nicea, to concoct a story about a healer-philosopher in Judea who seemingly arrived out of nowhere. The early years of this "Messiah" could easily be padded out with stories of the early years of other "saviors" - Mithra, Tammuz, Dioysus, and others. Rome had noted that as soon as you gave the people a savior, the people would stop thinking for themselves. This was desirable. The lingering memory of a white robed, barefoot, good looking young man with very long (never been cut) hair, who brought a message of peace and personal sovereignty to the far flung hills and villages of practically everywhere inhabited right across the Roman Empire, could not be quelled. Rome had to do something. These ideas of "giving to Caesar what is Caesar's (money) but spend the rest of your life doing the will of your maker and serving your fellow man", were far too revolutionary! Rome wanted all! It would snuff out memory from the common consciousness of this name "Apollonius"
It would keep the people coming to the priests (all born of patrician families originally), where they would hear in the confessional the people's most intimate secrets... including thoughts of insurrection. Very useful indeed! It's highly possible that Apollonius did venture into northern parts of Judea as he roamed around the hills, finding small towns and villages as he went. But for the "Church Fathers" to concoct their stories, Apollonius needn't have travelled there at all. A generational memory of Apollonius in Roman Judea still remained. It's quite possible these mainly illiterate villagers had forgotten his strange name... so accepting this name "Jesus Christ" as being the name of this young man in bare feet and shiny white linen clothing who had visited their home towns some 300 years before, would easily have been effected by powerful Rome. 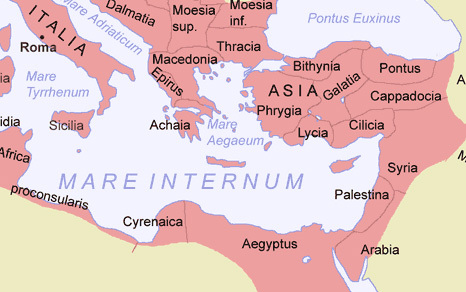 This map shows exactly where the territories were in Roman times... so we don't get confused. "Arabia" in the Empire was very small, and didn't go anywhere near south as the House of Saud does today. Palestina-Arabia together comprise the province the New Testament refers to as "Judea". This is "Judea" and its surrounding regions. It's such a small area - perfect for walking! As Paul-Saul was a Jew, you would think the "Christian churches" that would have been of greatest interest to him, and who he would have been sending letters of encouragement and exhortation to, would have been those communities in Biblical Judea, 2nd century CE. So why don't we find an "Epistle to the Christians at Jerusalem" ?? - at Judea, at Idumea, at Nabatea, at Peraea, at Decapolis, at Gaulantis, at Phoenicia, at Galilee ?? After all, these are the places where "Iesus Christus" was said to have travelled and lived !! Here's a map of "Anatolia" or some of us might know it as "Asia Minor". Obviously, it's modern day Turkey. 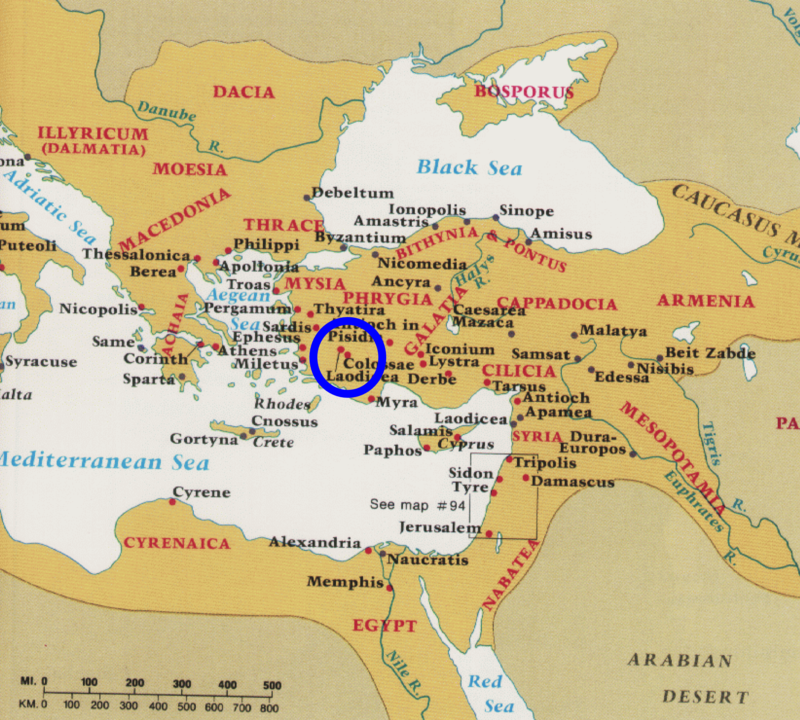 This makes sense to me (now that i'm looking at his particular map) of why "St Paul" wrote to all of these communities in Asia Minor - because this is where Apollonius is from! Why are ALL the epistles (predominantly) "to the churches" in Asia Minor? First we have the letter to the Romans (Italy obviously), then we've got two epistles to the people at Corinth (south Greece), a letter each to the Galatians (Galatia, Asia Minor), Ephesians (Ephesus, west coat Asia Minor near Ionia), Philippians (Phillippi, north in Macedonia), Colossians (Colossae, Asia Minor - 15 miles south east of the city of Pisidia), then two more letters to the Thessalonians (Thesolonica, southern Macedonia, on the coast). This is where Apollonius came from !!!! How "coincidental" is that? ie: Asia Minor-Anatolia, and Greece - the home of his beloved Pythagoreanism. ... or [in Babylonian Magic-speak] "A Paul from somewhere Greek-sounding, like 'Ionia',"
- would be writing to the towns and cities where he grew up and had studied, alongside his philosophical peers. There are NO letters to the people of Judea, which is in fact where you would expect to find the largest populations of Christians to be living, only a century after the crucifixion and resurrection of "Iesus Christus". Therefore, we have to ask why NO particular attention was being paid to those Christians who stood right in the firing-line of Judaism, by this so-called "Paul"? It is illogical that this Biblical "Saul-Paul" who (it is said) was a blood-line Jew, would not write to his fellow-Jewish Christian converts in Judea, in the first instance. Not logical !! "For the Jews have long been in revolt not only against the Romans, but against humanity; and a race that has made its own a life apart and irreconcilable, that cannot share with the rest of mankind in the pleasures of the table nor join in their libations or prayers or sacrifices, are separated from ourselves by a greater gulf than divides us from Susa or Bactra or the more distant Indies." 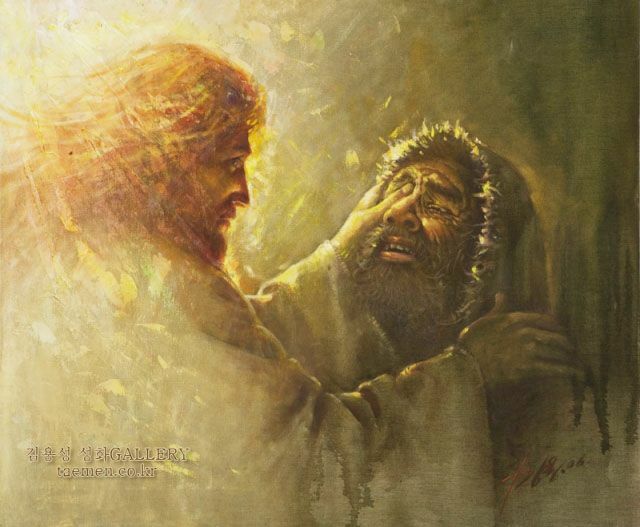 "Out of Galilee ariseth no prophet."